A small event that's big. And fun. 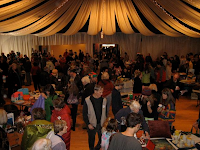 This is what our 8th Annual Abundance Swap looked like last Sunday in Ashland. We invented it in the heat of the "Black Friday" buy-buy-buy frenzy in 2002. We're proud of it. We're proud of the experience people have there -- here's this year's report -- and because of the larger context. We're amazed at the way this simple little event moves people. It seems to strike home more than all our eloquent rants against corporate consumerism. This idea is about as replicable as they come, which is why we put up a simple website with start-up suggestions. If you are done with the retail madness of the allegedly Holy Days, but still want to be part of a giving tradition, you might want to check this out. Bring a few friends together and and start your own Abundance Swap next year. It's easy. It's fun. Jeff - when I think of "Big, and Fun." I think of K.Chisholm. As in "Big, fun - and drunk"! Seriously, when this MF'er get's out, it's a liquor fest. I tired calling a taxi for him the other night, but I guess he thinks he can drive. sad, sad, sad. hope you all stay safe this holiday. Off topic here: I'm moving. Now that's big. Not very fun. Sometimes it's a little bit fun. PUnchy-tired bad fun. Off topic: but it seemed like a wopila party thread. So here's my offering. Before a year is up I'll throw a feed and cover a blanket with offerings from this way too much I have that my friends of three different tiospayes are moving for me. And we'll have wopila "thank you" giveway. Not quite potlatch - I'm too white for that, too clutchy and not deep/proud enough. But grateful, I can do that. Tangential to the topic: in the spirit of the Annual Abundance Swap, which, I think, is great, could we in the consumer-driven world possibly see our way to make significant changes in policy and lifestyles in order to help prevent ecological catastrophe? But, diametrically opposed to the spirit of the Annual Abundance Swap, a cabal of developed nations (the EU and the U.S.) are in Copenhagen attempting to ram through a completely unfair and wholly inadequate framework which has come to be known as the "Danish Text". The U.S., with Obama at the helm, is providing leadership in completely the wrong direction at the negotiations in Copenhagen. Portland should celebrate our deviant tendencies with something like a Solstice Doo Dah Parade. Maybe a bit more like the Castro at Halloween in flavor. Brave heart, rw. You're tougher than the times. I asked, exactly a year ago, what those experiencing post election euphoria would say when he watered down "Copenhagen", and correctly predicted, "nothing or spin; most likely nothing". As we all know that I'm certifiably out of touch, I guess I should be buying lottery tickets with all those lucky, one year out predictions. Great thought experiment. It seems to be difficult for a lot of people to imagine the season from other cultural POVs. Consider the pitiable fare on offer at twitter, with the #IfSantaWasBlack tag.